Puerto Rico is experiencing a crisis created by environmental injustice. Climate experts have long warned of the increasing risks of such a catastrophe. Houses destroyed by Hurricane Maria are seen in the neigborhood of Acerolas in Toa Alto, Puerto Rico, on Tuesday. This story is republished with permission of InsideClimate News, a nonprofit, nonpartisan news organization that covers energy and climate change—plus the territory in between where law, policy, and public opinion are shaped. A public health crisis is unfolding in Puerto Rico following Hurricane Maria as millions of people face a frightening array of urgent dangers, some of which may drag on for weeks or months. Nearly one week after the storm hit, federal emergency response personnel struggled to make contact with remote communities and restore critical medical infrastructure. As of Monday, the U.S. Federal Emergency Management Agency, already stretched thin by continuing recovery efforts from Hurricanes Harvey in Texas and Irma in Florida, had yet to reach six communities in Puerto Rico and was just sending its first shipment of water to the remote islands of Vieques and Culebra. “We are in response mode, and our main priority is saving lives, getting generators to the hospitals, and making sure that there is enough fuel for those generators to run,” FEMA spokesperson Jose Davila said. Carmen Yulín Cruz, the mayor of San Juan, the capital of Puerto Rico, gave a blunt assessment of the situation. The disaster facing the U.S. territory—and mirrored to an extent in the nearby Virgin Islands—is exacerbated by long-standing environmental justice issues facing a poor, underrepresented minority population on an island where climate experts have long warned of the increasing risks of such a catastrophe. A 2013 report by the Puerto Rico Climate Change Council—a group of more than 50 researchers, planners, economists, architects, sociologists, health professionals, hydrologists and climate scientists—spelled out the concerns. As of 2010, 342,000 people lived in floodways or coastal areas subject to storm surges, and 49 percent of the population lived in areas susceptible to landslides. 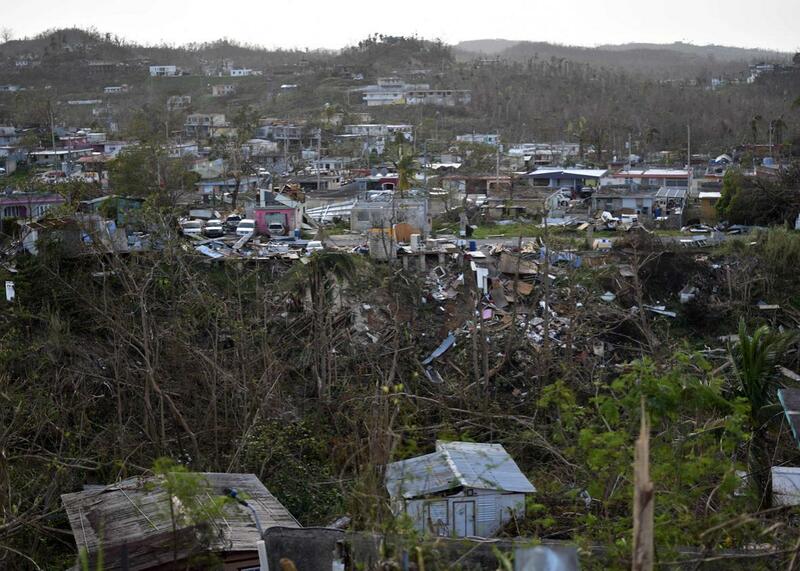 “The high proportion of population living in areas vulnerable to natural hazards, growing numbers of the elderly and other at-risk groups, and a relatively high poverty rate increase the island’s social and economic vulnerability to climate change impacts,” the study concluded. As the full scope of the devastation emerges, a growing chorus of government officials, community leaders, and health experts are calling on the federal government to step up their efforts. “It’s time that U.S. citizens in Puerto Rico are taken care of adequately, properly,” Puerto Rico’s governor, Ricardo Rosselló, said on Sunday. “You are going to have a preventable tragedy unless they really scale it up much faster than they have already,” Dr. Georges Benjamin, executive director of the American Public Health Association, said of the federal response thus far. Hamilton creator Lin-Manuel Miranda, whose parents were born in Puerto Rico, warned President Trump in a tweet on Monday that “there will be a lot of American deaths on your watch” if additional disaster aid isn’t quickly sent to the territory. On Sunday, former Secretary of State Hillary Clinton called on President Trump to dispatch the U.S. naval ship Comfort, a 1,000-bed floating hospital that was sent to New Orleans following Hurricane Katrina in 2005 and to Haiti after the 2010 earthquake. FEMA on Tuesday announced that the hospital ship, currently docked in Norfolk, Virginia, would be sent. It was expected to leave for Puerto Rico within four days and arrive about five days later, the Washington Post reported. A request by several members of Congress to waive shipping restrictions known as the Jones Act to help get fuel and supplies to Puerto Rico was denied by the administration on Tuesday with the argument that it wasn’t necessary, Reuters reported. The administration did waive the Jones Act after Hurricanes Harvey and Irma hit Texas and Florida to help move fuel. With temperatures in Puerto Rico climbing to 90 degrees Fahrenheit on Tuesday, one of the big concerns for health care professionals was a lack of air conditioning due to a lack of electricity. “People who are older can be at much greater risk for having heat related sickness,” Lauren Sauer, an assistant professor of emergency medicine at Johns Hopkins University School of Medicine, said. Small islands like Puerto Rico present unique challenges in the face of hurricanes because unlike on the mainland, residents can’t easily evacuate. First responders and their equipment were also pummeled by the storm. Poor communities are always hit the hardest in events like this, Mutter said. In the case of Puerto Rico—where nearly half the population is below the poverty level, the territory has no vote in Congress, and Texas and Florida are vying with the territory for limited federal disaster resources—inequity in recovery could be exacerbated. Complicating matters further, Puerto Rico has been facing a fiscal crisis that financially crippled its electric utility company. Communities next to Superfund sites, petrochemical facilities, and other toxic storage facilities may be at particular risk from flooding caused by Hurricane Maria. The Environmental Protection Agency had not been able to assess such sites for spills due to debris-clogged roads and difficulty getting personnel onto the island following the storm, EPA spokesperson Elias Rodriguez said on Tuesday. “The EPA plans to re-assess Superfund and oil sites in Puerto Rico, as well as at some key regulated facilities, as soon as we have our teams in place,” Rodriguez said via email. When the agency is able to inspect these facilities, they will likely find toxins spilling into neighboring communities, as occurred in Houston following hurricane Harvey, said Juan Declet-Barreto at the Union of Concerned Scientists. “If Harvey and Houston is any indication, that, in the next few days, is going to add even more to what is undoubtedly going to be a public health crisis,” Declet-Barreto said. Even when EPA officials are able to inspect the island’s superfund sites, they may not be able to test surrounding floodwaters for toxins, said Judith Enck, former EPA administrator for Region 2, which includes Puerto Rico. In the coming weeks, mosquito-borne diseases including dengue, chikungunya, Zika, and potentially West Nile will be another major concern, Sauer said. As the extent of the catastrophe and the enormity of the recovery effort that lies ahead becomes more clear, calls for greater, more equitable federal assistance are increasing.